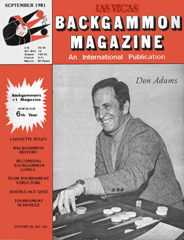 Backgammon has reached a level of competition achieved by no other board game. A major tournament is held somewhere in the world every weekend of the year. A person probably can attend a monthly regional tournament within a five-hour drive of his home. Local tournaments are held weekly in nearly every city in the country, and still are the backbone for getting people introduced to competitive backgammon. Don't show any type of favoritism toward anyone. Don't be pushed around by strong personalities. Don't make exceptions to rules for anyone. Don't ever tolerate poor sportsmanship: it is a very contagious disease. Do protect players' equity at all cost, both in judging and financing. Do give the players as much as possible for thie money. Don't take more than 15% from players' or calcutta pools. Do explain the distribution of prizes. Do provide trophies, not just cash. Do pay in cash immediately after each player wins his prize. Don't allow any player to make suggestions on how to run the tournament. Do be considerate, cooperative, helpful, friendly, courteous, etc. Do let people know what is going to happen in advance — no surprises. Do explain the tournament format and calcutta buy-back before the auction. Don't allow in late entries. Do start at announced time. Do explain all rules carefully. Don't play in your own tournament. Don't list names of people under "Tournament Committee" who will not be attending the tournament. Do familiarize new players with rules and formats. Do reward members for bringing in new members. Do try new things and get opinions. Do encourage spectators and kibitzers to play in upcoming events. These responses were probably made through past experiences, either as a player or director. Most people who put on the tournaments get little in return for their efforts, and do it because they enjoy playing backgammon and providing an opportunity for people to compete. Like Murphy's Law, if any thing can go wrong, it will; the same pertains to tournaments. Each director has his list of dos and don'ts in hopes of preventing problems. A player takes his skills to a tournament hopeful of piecing together enough wins to get recognition for his play. He should realize what efforts are put forth to organize and run a tournament and be courteous and gracious, win or lose. Pl.ayers should provide feedback to directors: be it positive responses or constructive criticism. Players always have the option to go to the tournaments which offer the most fair play and best return on their investment.